I said that today’s roughly 3.5% mortgage rates are going to look silly someday so not all of the low interest rate policies have hurt savers that can take advantage. If you’re able to lock in low interest rates you can also lock in future savings for many years to come. This chart led to a discussion about the pros and cons of a 30 year fixed rate mortgage since many countries do things much differently than the U.S.
You can plan ahead for the future. You know exactly what your payment will be every single month. During the real estate bust, many that went with adjustable rate mortgages didn’t plan on a reset to higher rates and it cost them. A mortgage works like a callable bond, so you’re able to refinance to a lower interest rate if they should fall. If interest rates rise, you still get to pay the lower than market interest rate. By spreading a loan over a 30 year period, you’re able to make a large purchase that you wouldn’t normally be able to make. You can write off the mortgage interest for a tax break. You can pay off the loan early to decrease overall interest charges. Refinancing isn’t free as you have to pay closing costs and each time you re-fi it resets the term of the loan. As rates have fallen drastically over the past thirty years, locking in fixed rates would have meant constantly refinancing and incurring closing costs to take advantage of the new lower rates. If you don’t pay off your mortgage early you end up paying a huge amount in interest costs over the term of the loan. The median home price in the U.S. is roughly $200,000. Over 30 years at a 3.5% fixed rate mortgage you’ll end up paying almost $125,000 in interest over the course of the loan. At a 6% mortgage rate, the total interest cost comes to more than $231,000, more than the actual mortgage itself. The majority of the interest costs come in the early years of a loan so it takes time to build equity in your home. Roughly 30% of interest costs are paid in the first 5 years of a 30 year loan. This is one of the reasons I’ve always been against buying a starter home when you’re young. It’s going to be nearly impossible to build equity in your home on a net basis after accounting for all costs if you try to jump from house to house in short order. Young people think they’re throwing money away when they rent because your “paying someone else’s mortgage.” What most don’t consider is the total expenses that come into play from homeownership, including the costs of a mortgage and all of the incidentals in the first few years. 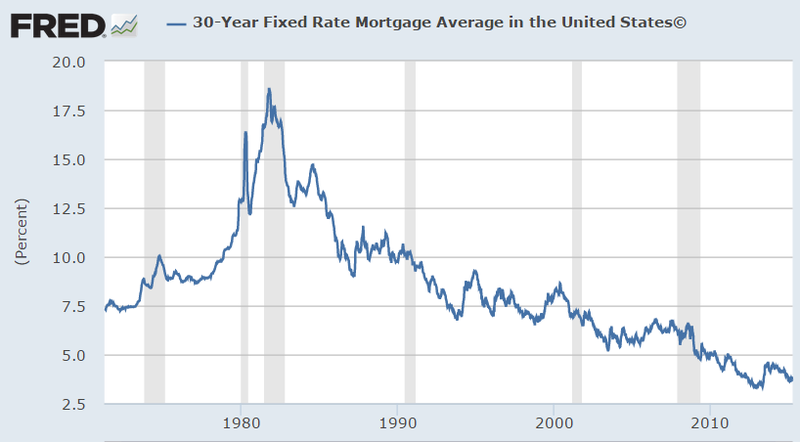 A 30 year fixed rate mortgage isn’t perfect. It’s possible interest rates could continue to fall. Mortgage rates are already near zero in some European countries. If you don’t pay off your mortgage early you’ll end up paying the bulk of your mortgage in interest rate costs. If you move after just a few years you’ll almost certainly lose money on the purchase and sale. The problem with all of this is that a home is perhaps the most emotional purchases most people will make in their lifetime. 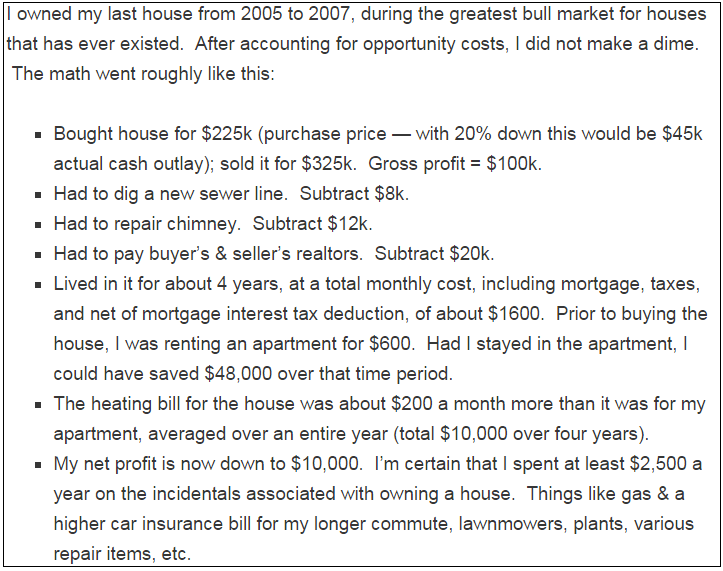 This is why so many people run into financial ruin because of a poor real estate decision. I’m not sure many people take into account mortgage rates when looking to purchase a home for themselves and their family. A home offers a kind of psychic income that’s difficult to quantify. Few people consider spreadsheets when purchasing a home. But for those that plan on staying in one place for a number of years, would like to have some certainty from a financial planning perspective and understand the dynamics of the real estate market, locking in an interest rate in the 3-4% range will probably look like a pretty good deal in the future. Excellent writeup Ben. I grew up in a midwest culture that valued home ownership as some sort of rite of passage or entrance into adulthood. Now I see that “paying somebody else’s mortgage” AKA renting is actually a really great carefree way to live. Eventually, I do plan on marriage/kids/etc, but for this stage in my life, renting has both served me well and saved me a great deal of cash. I know from experience that owning is much more expensive than renting. Renting also gives you much more freedom if you need to move for a job. I’m from the midwest too and I hear you on the American Dream of home ownership. People think it’s the logical next step right out of college but I always tell people to be patient. Wait until you are really ready to settle down. So the only alternative is to pay cash? What about opportunity cost? Take a low interest mortgage, deduct the interest, and invest the money instead of paying cash. Most people were arguing that the alternative is an adjustable rate mortgage but you could also make the case that a 15 or 20 year fixed is an alternative to the 30 year. I agree that paying cash isn’t a wise move, especially at these rates, which after the tax break will probably be close to 0% after inflation. Most wealthy people hold mortgages too. I think people just have to make sure they’re paid off before they retire. One key thing that you did not discuss, that is missed in all those rent vs buy calculators, and that really drives owning to be so expensive is….most people do not buy they same level of real estate that they would rent. What I mean is, many people will rent the $600 apartment (from your blog post example) but then buy a big single family home ($1600 mortgage) so of course it’s more expensive, it’s a much bigger property. I have loads of friends who bought a big 2700 sqft house from a one bedroom apartment and then complain how expensive it is. It is true that when you rent, your landlord is making profit off of you, or else they wouldn’t be a landlord. Owning the exactly same thing is very likely cheaper than renting it, but nobody does that. They almost always buy way more than they would rent and this leads to much higher cost. This is true. It’s very difficult to make an apple-to-apples comparison of renting vs. owning when talking about apt vs. house. I think the biggest benefit of renting for young people is that they have more flexibility to move if they have to for better job prospects. I think the main point isn’t renting vs owning calculations though, just that your house really isn’t “your biggest investment” as most assume. It’s your biggest asset. Yes you can build equity but most people just look at the buy prices and the sale price when thinking in terms of an investment without considering all of the costs associated with owning. I think a good rule of thumb is to not buy a house unless you plan to live there for at least 10 years. The transaction costs are just too high to plan to move sooner than that. Also, don’t buy a house more than 2.5 times your income. If you can’t afford that, rent and wait for the housing market to crash. Good call. I’m on board with that rule of thumb. I also think that assuming you’ll be living somewhere for at least 10 years will make people think twice about the quality of the home they buy — no need to buy a starter home just because it’s something you think you’re supposed to do. The “locking in a low mortgage rate” argument doesn’t make much sense — people buy based on what monthly payment they can afford to pay, not based on the ultimate price tag. The interest rate just determines how the bank and previous owner allocate the profits from the sale. And if anything, lower interest rates are worse because the tax deduction is lower. Absolutely interest rates matter. Saying you’d rather pay a higher mortgage rate is like saying you would like to spend a dollar to save 30-40 cents. The reduction in monthly payment more than makes up for the tax savings and interest costs you’d be spending on a higher interest rate loan. Of course most people don’t time their purchase of a home with the interest rate cycle so this is mostly for those who are in a position to refinance. But the tax break should never take precedent over a lower interest rate. You seem to miss my point — interest rates don’t matter because demand turns on what monthly payment buyers can afford. If the average buyer can afford $1k/mo then the average house will have to be $200k at 4% or $140k at 8%. $140k at 8% is the better option. Now I see what you’re saying but I’m not so sure the real estate market is quite that efficient as far as prices and interest rates go. I’d have to look into it some more. I’m sure there is some correlation but I’m not sure it’s as much as you’d think. It’s really a confidence sort of market. Holding period is one of the most critical factors in successful home ownership and 4 years is simply too short a time period in which to build much equity, even if the chimney does not need repair. For that same reason, “moving up” frequently often makes little sense as home owners are typically selling at the top of the market in one neighborhood to buy in at the top in a different neighborhood. Yes, they end up with a bigger house, but they also typically end up with a much bigger mortgage. Buried in the New York Times website is a very good rent vs. buy calculator that factors in far more expenses than the typical calculators I’ve seen. The result is a numerical cost/benefit breakdown, as well as a break even analysis that I would encourage every prospective home buyer to consider. However, home ownership is an important element of the American Dream and I am not encouraged that many people will be dissuaded from buying a home on purely economic terms. People have been sold the dream for a long time. I’m not saying people shouldn’t buy a house — I own, but they just have to be smart about when and why they make that purchase. I agree with on the moving up thing — it’s generally a terrible idea and a good way to waste a lot of money on real estate commissions and interest rate costs. Good advice here. In general I think there’s way too much hype about homeownership, the American Dream, and so on. Also a lot of shoddy analysis where people calculate their gross profit on a house and don’t consider the holding costs which leads them to think housing is a great investment when it generally is not. Not to say that homeownership is not valuable. There’s potentially huge value in hedging against rising rents (as a lot of renters in the Denver market have been finding out) and it can be a good forced savings plan for people that need the external discipline. But those benefits come with some definite risks. Well said. And that’s my whole point — think about the risks and rewards of each strategy. There are costs with each but don’t choose one or the other because you think you have to. In the 28 years from 1987 to 2015, the Case Shiller 10-city index delivered a 4.0% compounded annual return. That’s a price-only, unleveraged return. The S&P 500 returned about 8%, price-only. Many people believe that home ownership is a lucrative investment, but usually their stories involve a long holding period, lots of leverage, or fail to account for depreciation and updating costs. In principle, if an owner-occupied house merely tracks inflation, it’s a zero real return asset. After expenses, it’s a negative real return. It’s worth it for me, but regarding a house as an ‘investment’ is delusional. Exactly. Shiller’s numbers have shown that housing barely keeps up with inflation over time. I say housing is not an investment but an asset. Most people don’t understand the difference. I believe the comparison would be apple to apple by including the annual incremental of rent, assuming both renter and owner stay put in one place, then home ownership is proven to win. In a stable economy rent increases always outdo the inflation. Only in extreme recession (2008-2009) where price is falling a renter would win. Four years dont justify to buy, that is pure gambling. a house is a long term investment, and by that it doesnt justify to move every time a kid is born (Warren Buffett didnt). Total return is also impacted by cost of capital over maximum home depreciation, not just mortgage period, which in my opinion up to the time when a home incurs a major overhaul/repair (roof, siding, foundation)..the shorter an owner stays in one home, the more the capital cost would outweigh the depreciation, the mistake is investing a home as a short term growth stock, hardly ever going to give a decent return. 1. Living the lifestyle that you get with a home costs more than that of an apartment. You get more room, the freedom to renovate or at least put up whatever wall art you want and paint whatever color you want. You also “get to” maintain the yard…is that a cost in time and money, or is it something that you like? It’s personal preference. Also, try having a family in a 2BR apartment. If you don’t “need” the room of a house when you’re a single person, that “lifestyle” will cost you something. 2. You can’t count on making money on a house in two years. The payoff is more likely to occur in 10 or 20 years. My house payment (3 BR/2 Bath/half-acre of land) now is less than rent on an apartment. Why? Because the price of my home is what was the going rate 28 years ago. In the example, a correct analysis would be the former $600 a month renter buying a small condo that would typically rent for $600. I’m sure they would then have made out well. A general re investor rule of thumb would be monthly rent = 1% of value, so we are talking about a $60k condo instead of the $225k house mentioned. If he wanted to spend $225k, buy 4 $60k condos, live in one, rent out the other three for $1800 per month, and he’d be living for free plus income, principle growth, appreciation on $240k and the tax advantages. Always compare apples to apples or don’t waste the readers time, or worse mislead them.